Thank you all so much for being incredibly supportive! I have just three days left in this campaign. Follow this link to get involved! I hope to reach second and FINAL goal of $2,000 for Otherside Brewing Co's "Tapped" Competition by December 3. A special thanks to Edward Riggall, Jim and Mary Ann Scott, Pete Mattiske, Jess Scott, Cale McMillen, Christopher Young, Susan Hesford, Paul Jarvis, Beth Baker, Alle & Pier, Peter Brown, Sally Anderson, and Daniel Jackson. In August 2018 I was commissioned to photograph the East Pilbara region of Western Australia. Here is video footage I shot along the way. Landscape Photographer Candice Leslie was a recent participant in a Landscape Photography Workshop I ran in Albany. We had a great few days visited some of the most beautiful beaches in the South West. Here are just a couple of the amazing photographs she captured and some information about her process in developing as a Landscape Photographer. You can follow her work at https://www.instagram.com/candicelesliephotos. "18 months ago I started learning about photography on You tube and decided this was going to be my hobby. Now I know a fair bit more and I am passionate about it. Especially landscapes and Seascapes. I do also try portraits, wildlife and some Macro. I would have to say Landscapes and Seascapes are my favourite. In the last 18 months I have travelled a fair bit trying to get better and learn as much as I can from some wonderful photographers I have come to admire and have inspired me to improve my new passion. I have done workshops in NewZealand/ Tasmania/ Victoria/ Adelaide/ Cairns/ and my most recent one WA and beautiful Albany. I would have to say my favourites were, Little Beach/ Salmon Holes and Frenchman’s bay. Thanks to Ben, I have not only learned so much about landscapes but also Post processing. My trip was ever so rewarding and all I can say is, I cannot wait to get back there and do some more wonderful photography of the beautiful landscapes and Seascapes in WA." This year I will once again be running some workshops in the Albany region starting at the end of December and into January. They will be run over a 4 day periods and cover not only some basic photography theory but also some more advanced topics such as timelapse photography, using filters, and exposure blending to create stunning landscape photography. The workshops will be half days only with theory sessions being held at Hybla function room in Middelton Beach. If you are interested in finding out more please fill in the form below and I will reply with any questions, and schedule of events. Knowing your experience and camera brand and lens's that you use will help with the workshop running smoothly. ALBANY PHOTOGRAPHY WORKSHOP - braving the cold to do a recce for some photography workshops I will be running later in the year. Feel free to contact me for more details. I will have some photos exhibited next week for the 2017 East Fremantle PS Artex, including this one below. Today I received an email from chief editor at Capture Magazine’s Marc Gafen congratulating me on being selected as one of Australias top 10 emerging photographers for my 'Portrait of Cars' documentary/photojournalism project. The 2017, Australia’s Top Emerging Photographers received more than 800 portfolios and 4,800 images for this years Capture Magazines annual competition. You can follow the project at www.instagram.com/benreynoldsphotographer, and www.coolcarphotography.com. The beautiful Emu Point and Middleton Beach in Albany, Western Australia, captured on Friday 21st April 2017. Recently I had a trip to the Kimberley region of WA. One of the highlights was a 125km slow, slippery rd we took called the Leopold Downs road just out from Fitzroy Crossing. It is a spectacular rd and I could have easily spent a week there photographing. It loops around past Tunnel Creek and Windjana Gorge which are spectacular in themselves, however there are so many little camping spots and side roads such as the Boab Quarry that we were lucky enough to discover . Here is a quick timelapse of one of the mystic valleys we found. I am pleased to announce that my photograph 'A Loose End' is amongst the finalists for the 2016 CLIP Award for landscape photography at the Perth Centre for Photography. 'A Loose End', below, was taken near Tambellup on the way to Albany using a medium format film camera. Exhibition opens 17th of March, 6.30pm, 18 Colin St West Perth. Last month I went camping in the beautiful Gascoyne and Pilbara region. This blog post is about the techniques I used for this gascoyne time-lapse I captured below. Somewhere between Gascoyne Junction and Mount Augustus, we pulled off to the side of the road to camp. I quickly found a good composition, set my camera on a tripod, connected my intervalometer, and pressed the shutter to get a time-lapse sequence underway, and then had a little explore before it got too dark. We climbed the rocky formation and from the top we could easily make out Mount Augustus in the distance, our next location. There wasn't a cloud in the sky, which meant it was going to be a very cold night, but also meant the stars were going to be clear and beautiful. The cold clear night combined with no light pollution from surrounding towns meant i could get some beautiful star trails early in the evening and early in the morning and still get a good nights sleep! This time-lapse consisted of 472 photos over 4 sequences. When converting photos to make a time-lapse, approx. 30 photos are needed for every second of video (if making a video at 30fps), therefore my 472 shots made 15 seconds. The two important camera settings I used for this time-lapse were manual exposure and manual white balance. Sequence 1 - 284 photos began at 5.35pm and finishing at 6.40pm changing my settings as it got darker, starting at f10, 1/10 sec shutter speed and 100iso and finishing at f10, 30 sec shutter speed and 1250iso. Sequence 2 - 79 photos beginning at 7pm and finishing at 8pm, with the setting staying at f2.8. 25 second shutter speed and 12500 iso. Sequence 3 - 142 photos beginning at 5.15am and finishing at 6.45am, settings starting at 30sec shutter speed and 2500iso and finishing at 1/6 sec and 500iso. Sequence 4 - 65 photos beginning at 6.46am and finishing at 7.15am, settings starting at .3sec shutter speed and 100iso and finishing at 1/60 sec and 100iso. There are many different ways to process time-lapse photography. If you are starting out and have photoshop and lightroom, it is easy to use these CC software only. However for this one I used LR Timelapse. LR Timelapse is perfect if you need to be constantly changing the exposure settings over time during the shoot, eg from sunset to night, LR Timelapse will smooth out the transition for you automatically through what is known as the Holy Grail technique. Finally the sequences where opened in Premier Pro where the transitions where made. Arriving and setting up for the timelapse sequence 1. 240 frames @ 5 sec interval = 20 mins. It will also depend on how you want the subject to appear to be moving, eg clouds will move faster with a longer interval. Please feel free to leave comments, ask questions, or contact me regarding upcoming workshops or 1 on 1 landscape photography tuition. About - This photo got a lot of interest when I posted it on facebook so I have decided to write a quick 'behind the photo' post about what was involved. Summary - It is always exciting as a photographer to arrive at a scene unfolding in front of you as spectacular as this one. To get the shot, it required some pre-visualisation and then some quick thinking so I didn't miss the moment. Lens Selection - My first decision was which lens to select. 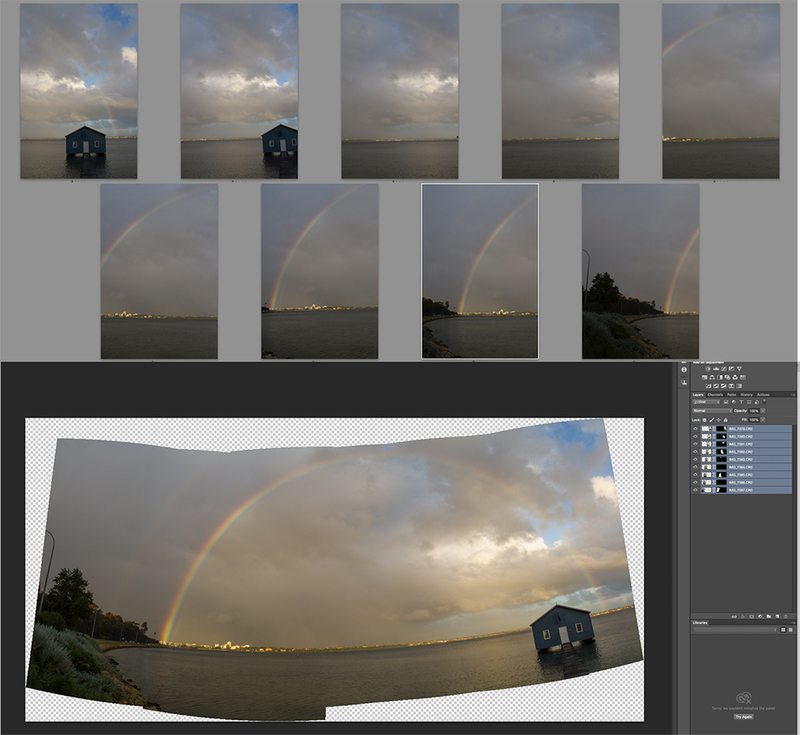 I perhaps could have captured this whole scene in one shot using an ultra wide angle or fish eye lens, however the boat shed and rainbow would have seemed distant and distorted. So I went straight for my 24-70mm lens with a plan to take multiple photos and stitch them together later in post production. This way the two 'star' elements of the image, the boat shed and the rainbow, would seem compressed together and provide more impact. I took 9 photos overlapping by about 1/3, handheld. Normally I would have used a tripod to ensure a good stitch in photoshop, but this would have taken too much time to set up, and I only had a couple of minutes at most. Camera Settings - Knowing that I was going to stitch the photos together later in photoshop, I needed to keep all photos the same exposure and the same focal point. I set all my camera settings to manual, metered the scene and then underexposed by 1 stop to ensure I didn't lose detail in the rainbow . That gave me (f10, 1/160sec, 200 iso) and then I took 9 shots in portrait orientation making sure I kept the horizon level and rotated each shot over the cameras nodal point. The Post Processing - After loading the photos into Lightroom, I made some basic adjustments including 'enabling profile corrections' in lens correction, and opening up the shadows from for the boat shed which was underexposed. I then 'merged to panorama' in photoshop where I got a little creative using some photoshop selection masks and filters from Nik Software to warm to sky and smooth the water. Then I saved the photo back into lightroom where I sharpened it, and reduced the noise before loading to my website for sale. 'UNREAL' EXHIBITION - ON NOW! thanks for the photo Pete Mattiske! I am here in Sydney gallery sitting at UNREAL, an exhibition in the hip suburb of Surry Hills, which I am a part of. It is one of the many exhibitions that makes up the Head On Festival, Australia's largest photo festival and the worlds second largest. During my stay here I am participating in workshops, attending gallery talks from photographers such as George Fetting and Sandro Miller, attending the Head On Awards tonight (which i was lucky enough to be a finalist), screening nights, as well as some mentoring from curator Fiona Wolf-Symenides. I hope to share information about the Head-On Festival over the coming days. UNREAL opening night is this Sunday 3rd May at 3pm at M2 Gallery in Surry Hills. Hope to see you there, if you are in Sydney! A big thanks to the Australia Council for the Arts and ArtFlight for this opportunity. I have been selected as a finalist in Australia's Head-On Prize. The image selected can not be promoted until May 1.